David Beckham met his new team-mates for the first time on Tuesday when he joined up with Paris Saint-Germain at the team hotel in Valencia. 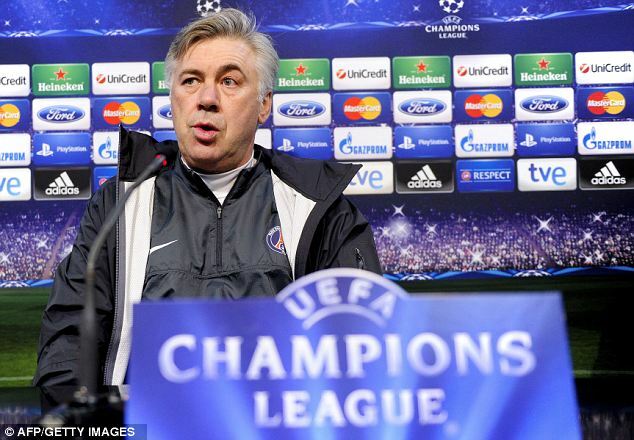 PSG boss Carlo Ancelotti said the 37-year-old midfielder would watch the Champions League last-16 encounter at the Mestalla tonight before returning to France with the team. Beckham joined PSG on deadline-day, agreeing a five-month deal, but has since trained with Premier League club Arsenal in London to fast-track his fitness. PSG confirmed this morning, however, that he was set to meet his team-mates for the first time at a lunch at the team hotel after arriving in Valencia this morning. 'David Beckham joined the hotel where the Paris Saint-Germain team is in Valencia at 11.30am (10.30am GMT) on Tuesday,' a club statement read. 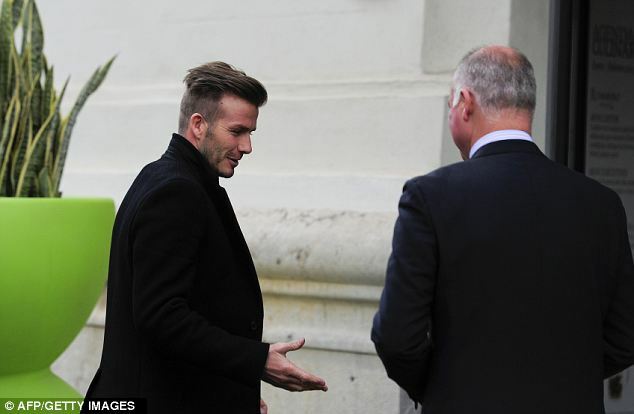 'David Beckham landed at Valencia airport at 11am and was met by assistant team manager Olivier Letang. 'The player who will wear the No 32 will meet his new team-mates at a lunch before attending tonight's game from the stands at the Mestalla. PSG coach Carlo Ancelotti hinted after last Friday's 3-1 home win over Bastia that Beckham could make his debut at Sochaux on Sunday. Beckham has previously stated he expects his return to European football, following five years with the Los Angeles Galaxy in the United States, was likely to be at least another fortnight away. That could mean he plays his first game against Joey Barton's Marseille at the Parc des Princes on February 24.